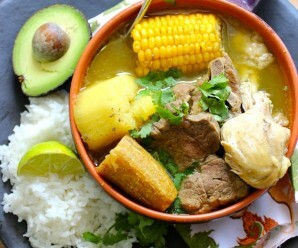 In the United States, we think of hot soup as a winter dish, but in Colombia we eat soups all year round in every region of the country. 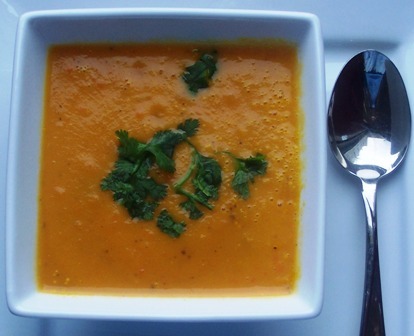 We always welcome a good bowl of soup and this carrot soup is delicious and easy to make. Heat the oil in a large pot over medium heat. Add the onion and carrots and cook for 5 minutes, stirring occasionally. Add the garlic and cumin and cook stirring for about 1 minute. Add the water, chicken or vegetable bouillon,potatoes, salt and pepper to your taste. Bring to a boil, reduce the heat to medium low and cook until the vegetables are tender about 30 minutes. 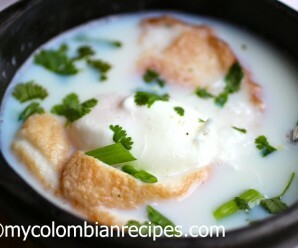 Add the cilantro and transfer the soup to a blender and pureé until smooth working in batches if necessary. Return the soup to the pot and cook over medium low heat, stirring once and season to taste. Laddle the soup into bowls and garnish with cilantro. Erica agree with you here soup is only for winter, that is to say perfect for cold days we’ve nowadays. Nobody makes here soup in summer, different customs! The Cumin gives a nice extra flavor to the soup. Love soup all year round! This sounds delicious, cumin is a wonderful flavor addition! Love the cumin in the soup! even tho’ used in such small amount it imparts that slight smoky flavor which is so significant! & Erica I love the plantains in the sugar syrup. every afternoon i have a sweet craving:-) i feel like having it now. 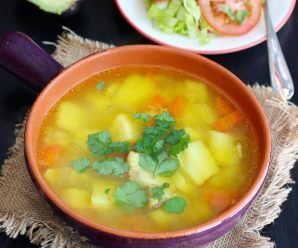 This soup just sounds so refreshing and I love the addition of cumin, it adds such a nice warmth to the soup. 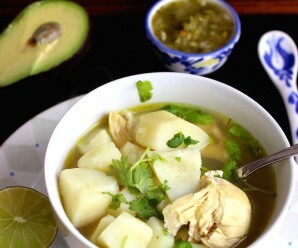 Hello, This soup is easy to prepare and has wonderful flavor! Just a note – I didn’t see the amount of onion necessary (I added 1/2 cup) and the potato is missing from the directions in the recipe. Not that you can’t figure this out though…Thank you for the recipe. Thank you so much for the comment! I added the amount of onion to the ingredients and the potatoes to the directions. This soup was really delicious….the perfect lunch and I served with salad on the side and it was filling. Thanks. This has become one of my favorites!! Thanks for sharing! This soup was really easy to make! Everyone at our house loved it and there was not a dribble in the pot after. Now I’m checking your blog and have a question on how -what camera do you use, where do you take photos:inside/outside- of the different dishes. Great pics by the way.